Male/Female; Graduate of any 4-year courses, preferably of Engineering or any related course; With experience working in a manufacturing plant is a plus; With knowledge in exploded drawing and in using caliper; Has excellent verbal and written presentation-communication skills; Can read and understand engineering drawings; Has strong ability with MS Office. At least College level; Computer literate and can do multi-tasking; Fluent in English; Jolly and enthusiastic; Focused and determined; Good communication skills (active listening); Goal-oriented / Money-motivated: Can work under minimal supervision; Can work under pressure; Experience in a call center is an advantage but not a requirement. 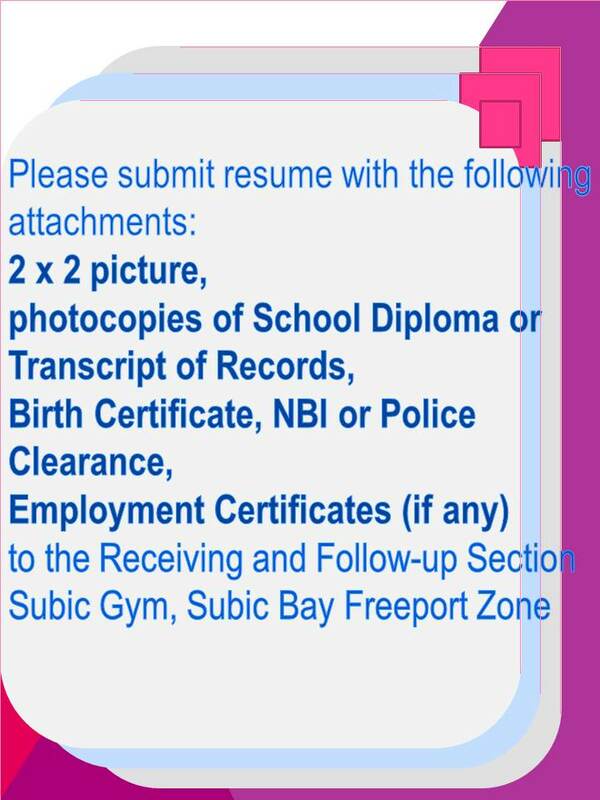 Male/Female; Candidate must possess at least a Bachelor’s/College Degree, Professional License (Passed Board/Bar/Professional License Exam), Electrical, Electronic, Mechanical, Mechatronic / Electromechanical or equivalent; With knowledge in Building and Facility Management; Can communicate in English and Filipino; At least 5 years of working experience in the related field is required. Male/Female; Candidate must be a graduate of Industrial, Electronics, Computer Engineering or tis equivalent; Must be knowledgeable in PLC programming and its pre-requisites; Can interpret technical drawings and systematic diagrams in electronics, electrical and electro-pneumatic works; Must be proficient in designing using AUTOCAD and other computer applications; Experience in a manufacturing/ service/ industrial or electronic industry is an advantage; Hardworking and goal-oriented; Willing to work long hours and on shifting schedule; Can work under pressure. Candidate must be a graduate of any 4-year Business or Computer course ; At least 6 months experience as Production Leader in a manufacturing company; Must be knowledgeable in computer applications; Excellent in both oral and written communications; Can work under pressure; Fresh graduates are welcome to apply. Candidate must be a graduate of Mechanical or Electrical Engineering; Experience in a Manufacturing / Service/ Industrial or Electronic Industry is an advantage; With excellent communication skills both oral and written; Must be knowledgeable about Pure Water Treatment, Industrial Waste Water Treatment and Domestic Waste Water Treatment; Must be knowledgeable about Diesel Generators, Chillers, L.P.G. supply System and Electrical system; Must be proficient in computer application; Must be hardworking and goal oriented; Can work long hours and shifting schedule; Can work under pressure; Fresh graduates are welcome to apply. ; At least 5 years of working experience in the related field is required. Male / Female; Candidate must be a graduate of BS in Industrial/ Electronics/ Computer Engineering or its equivalent; With at least 2 to 3 years of Quality Assurance and Customer Service experience; With background in SPC; Must be knowledgeable in computer applications; Has excellent verbal and written communication skills; Can work under pressure. At least a Bachelor’s Degree in procurement, Business Management or Logistics; With industry experience of at least 2 years; Strong ability to develop positive relationships with suppliers; Communicates well in English both oral and written.